This critically acclaimed album was recorded in January 2014 with the Orchestra of the Age of Enlightenment and former choral scholar Gerald Finley. It faithfully recreates the 1889 premiere of the Requiem, the instruments and techniques used by the orchestra being typical of those used in a French orchestra of the late nineteenth century. Fauré’s Requiem is a work whose popularity has never waned since its first public performances and it has often been noted that its appearance broke with a tradition espoused by the many Requiems that preceded it. In contrast to what are commonly seen as more overt and theatrical pieces, not content simply to suggest the eternal serenity of the afterlife but intent as well on depicting the tumultuous anger of the Last Judgment, Fauré’s work sets out to conjure a peaceful and consolatory sense of rest. In the composer’s own words, ‘it is of a sweet nature, like that of the composer himself’ (Gabriel Fauré, Correspondance, ed. Jean-Michel Nectoux. Paris: Flammarion, 1980, p. 241: a letter from Fauré to Eugène Ysaÿe, dated 4 August, 1900). The history of the work can be divided into three periods. In the initial period (1887-1888), the Requiem was made up of only five movements (‘Introit and Kyrie’, ‘Sanctus’, ‘Pie Jesus’, Agnus Dei’, and ‘In paradisum’). It was scored for a small ensemble, without wind instruments: a mixed choir (with a soloist in the ‘In paradisum’), 2 violas, 2 cellos, a bass, an organ, a harp (only in the ‘Sanctus’ and in the ‘In paradisum’), and timpani (only in the ‘Introit and Kyrie’). In its next phase of development (1888-1894), the work takes the shape that is familiar to audiences today. Fauré added the ‘Offertorium’, which begins with the only baritone solo (‘Hostias’), and which he finished in February 1889. The choral section, ‘O Domine’, which would eventually precede and follow the solo, was added at a later date, though it is now impossible to pinpoint that with any certainty. He also added the ‘Libera me’, whose origin is probably to be found in a piece composed earlier, in 1877 or thereabouts (Jean-Michel Nectoux, Gabriel Fauré. Les voix du clair-obscur. Paris: Fayard, 2nd edition, 2008), and for which a complete score was already available in 1889. In parallel with these additions, Fauré also modified the original orchestration a bit, adding to different movements two bassoons, two or four horns, two trumpets, and three trombones. This new version would be played until its replacement by what we now call the ‘definitive version’ from 1900. This later period is one marked by the ‘concert version’ of the piece, the one best known by the public. Following repeated requests by his editor, Hamelle, Fauré finally agreed in August 1898 to provide a version that would suit a standard orchestra (Fauré, Correspondance, op. cit., p. 232 (letter to Julien Hamelle, 2 August, 1898)) and would include, in addition to the supplemental instruments added in the previous years, two flutes and two clarinets (‘Pie Jesu’). He also added violins to the ‘Agnus Dei’ and the ‘Libera me’. The first performance of this definitive version was given in Lille on the 6 April 1900, followed by another at the Trocadéro in Paris on the 12th of July of the same year as part of the Universal Exhibition. 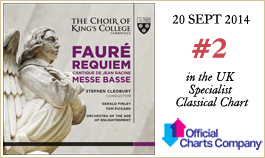 The performance history of the Requiem is interesting, for it testifies to the immediate success the work encountered, and preserves, as well, a record of the changes that Fauré introduced as it was being performed. The first performance took place in the Church of the Madeleine in Paris on 16 January 1884 (Fauré, ibid., p. 138 (letter from Fauré to Paul Poujaud, dated 15 January, 1888)). It certainly left a strong impression on the listeners, if one is to judge by the brief account written by the critic Camille Benoît, under the pseudonym of Balthazar Claes, for the weekly publication, Le Guide musical: “I have just returned from my first hearing of the Requiem Mass of Gabriel Fauré at the Madeleine, and just in time to share my impressions with this week’s readers of the Guide. The impression that this magisterial work by a young composer made on the elite group of musicians and artists who attended the performance was profound. I will not go into further detail but suffice it to say that a work of this importance and worth, the most striking proof of the great talent of its author, merits a full discussion that I will go into a later date and at the appropriate time. Today I write only to mark the date and to register the effect that it has made (Le Guide musical, No 3, 19 January 1888, p. 21). Other performances took place in 1888, about which there is little information. The second performance took place two weeks after the first and was done ‘on a more restricted basis and budget’ (Fauré, Correspondance, op. cit., p. 140 : letter to Eugène d’Eichtal, dated probably to 31 January 1888). Another that took place on 4 May of that year was probably the one that Camille Benoît (‘Balthazar Claes’) was referring to in his piece published in the Guide musical (No 24 and No 25, from the 14 and 21 June 1888, p. 167): “I will leave aside for the moment, without including it in this end-of-season summary, a work of rare and finished beauty that was performed a couple of weeks ago at the Madeleine; the Requiem by M. Gabriel Fauré. Instead, I will dedicate to this work a study of its own once I am able to give it the time that it deserves”. (Fauré, ibid., p. 141: from the letters to Robert de Montesquiou on 3 May 1888 and to Paul Poujaud on the same date). The critic did, in fact, write a more detailed study of the work in August 1888 (No 32 and No 33 from the 9th and 16th of August), which shows that it was, at this date, still composed only of the original five movements, but also that Fauré had already added a brief section for the horns and trumpets during the ‘Sanctus’ (‘Osanna’). The following year, on 13 February, the work was again performed at the Madeleine, as part of the annual Mass organised by the French Red Cross “for the soldiers and sailors who died in the service of France”. This ceremony took place in a “very crowded” church, in the presence of numerous military and political figures, including the Marechal Mac-Mahon. The importance of the event is attested to by the appearance of articles covering the performance in all of the major daily newspapers. Even if these accounts are too imprecise for us to be able to determine the actual contents of the work at that time, we know that it was “sung by the choir, which had been joined by a portion of the orchestra and the chorus of the Opéra, all under the direction of M. Gabriel Fauré” (Le Figaro, 14 February 1889), and that the organ was played by Théodore Dubois (Le Matin, 8 February 1889); the ‘Pie Jesu’ was sung by “a young child, M. Paul Verdeau, a soprano soloist” (Le Figaro, 14 February 1889); and the solos were sung by “M. Auguez, from the Opéra” (Le Siècle, 14 February 1889). This last detail is important because the participation of this baritone, Numa Auguez (1847-1903), who is said to have sung the solos, would indicate that the ‘Offertorium’ and ‘Libera me’ were already incorporated into the Requiem by that time. It is the work as it was performed on this date that is presented on this recording—and for the first time ever (The 1889 version was published by Carus-Verlag (Stuttgart) in 2011 (CV 27.3110)). The main differences between it and the later edition are indicated further on. V/. Hostias et preces tibi, Domine, laudis off erimus: tu suscipe pro animabus illis, quarum hodie memoriam facimus. Fac eas, Domine, de morte transire ad vitam. *Quam olim Abrahae promisisti et semini ejus. We offer you, Lord, the sacrifice and the prayers of our praise: receive them on behalf of those souls we commemorate today. Lord, let them pass from death to life. The effect of the first cut was to extend the deliverance of souls to all of the dead and not only to the faithful. The second cut removes the mention of Saint Michael, perhaps because of his position as chief warrior of the celestial armies and his role as supreme judge. We should note as well the insertion of the last verse of the sequence (‘Pie Jesu’) after the ‘Sanctus’, either to serve as music for the elevation (of the host) before the ‘Benedictus’, or as a replacement for this latter section, as in the French tradition. Like Gounod in his posthumous Requiem, Fauré chose as his solution a simple replacement. The ‘Libera me’ is a response which is taken from the absolution for the dead, a ritual which follows the Mass for the dead. Even given that we do find this same substitution in Verdi’s Requiem, its presence is actually quite rare in this genre. What it does is give Fauré the chance to insert a brief evocation of the ethos of the ‘Dies irae’, a phrase which makes an appearance in one of its verses. Just as rare is his setting to music of the ‘In paradisum’. This piece consists of a melody written to accompany the carrying of the body from the Church to the place of burial. This is a choice that reinforces the dominant colour that Fauré wished to give to his Requiem, a piece which ends with light: the major key corresponding to the initial D minor, a high pitch, and a great sense of calm. The ‘Offertorium’, as it is interpreted on this recording, will surprise the music lover used to hearing the complete version, also included on the recording. As was indicated above, in 1889 the piece did not yet include the chorus, ‘O Domine’, and it appeared instead as a piece for solo baritone and orchestra (‘Hostias’). Once the initial surprise has passed, however, one can appreciate the coherence of the 1889 version, in which two solo pieces of approximately the same length, the ‘Offertorium’ and the ‘Pie Jesu’, alternate with choral pieces (‘Introit and Kyrie’ and ‘Sanctus’). Furthermore, the thematic connection between the ‘Te decet’ from the ‘Introit and Kyrie’, the ‘fac eas Domine’ from the ‘Offertorium’ and, finally, the violin solo from the ‘Sanctus’, reinforces the unusual character of the ‘O Domine’, the text of which, as we have seen, bothered Fauré. The first version was written for a small orchestral ensemble. The absence of violins recalls Cherubini in certain movements of his two Requiems. The organ is used throughout and it often supports the strings. The brass sometimes plays a part in the solos. One beautiful passage with a solo, which disappears in the 1900 version, is the unison entrance of horns and trumpets during the ‘Introit and Kyrie’ (bars 28–29). Similarly, the passage which precedes the start of the ‘fac eas Domine’ in the ‘Offertorium’, a part that was given to the organ in the 1900 version, was accompanied by the first horn in the original version. At the end of the ‘Libera me’, the kettledrums are used heavily right to the end of the original version while they disappear after bar 124 in the 1900 version. In the final resolution, the brass joins the strings to reinforce the force of the final burst. One can safely say that the original version uses fewer dynamic marking and that a rather large number of dynamic indications were made at a later date. One interesting example can be found in the ‘Sanctus’: the progressive dynamics of the later version, e.g., a crescendo that extends from bar 37 and the ‘poco a poco cresc.’ indication that occurs in bar 39, are absent from the original version, where the f (forte) indication for the sopranos at the start of bar 42, and the ff (fortissimo) for the orchestra that follows it, both arrive quite suddenly. The Cantique of Jean Racine is one of the works composed in Fauré’s youth. It is widely accepted that the young Gabriel won the first prize in composition at the Ecole Niedermeyer in 1865 with this piece, after having tried in each year since 1861 and having won the second prize in 1864. The piece is dedicated to César Franck, who conducted it for a concert of the Société Nationale de musique on 15 May 1875. It was published in its original version for choir and organ in 1876. An instrumental version was done in 1866 and an orchestral version in 1905. The text does not actually come from Racine’s Cantiques spirituels, as one might assume from the title, but from the Hymnes traduites du bréviaire romain (Hymns translated from the Roman breviary). It comprises a paraphrase of the hymn, Consors paterni luminis, attributed to Saint Ambrose and sung at Tuesday matins. It appeared for the first time in Nicolas Le Tourneux’s 1688 translation of the Bréviaire romain. The text is made up of three stanzas, all of which are set to music following a clear musical conception. The first two are separated by a solo organ interlude. The beginning of the second stanza, with the full choir, contrasts with the first stanza, with its successive choral entries. The double series of repetitions on the phrase ‘qui l’a conduit’ (he who led him), with its rising dynamic (four entrances at mf, then four more at f), leading to the dramatic climax of the piece, marks the end of the stanza. The third returns to the initial material, with successive entrances. The main key, D flat major, is quickly regained through a slide from the dominant of the relative key (B flat minor) to the tonic of D flat major. The last verse, ‘Et de tes dons qu’il retourne comblé’ is repeated several times, gradually diminishing with each repetition, supported by alternating phrases with the solo organ. “The Messe Basse is worth more than just a simple mention amongst other biographical details—it seems to have been intended for the use of religious women, for it is too peaceful to be intermixed with the agitations of the modern world—one might like to hear it in one of those beautiful cloisters in which silence reigns, where life is already a form of death, and where death is but the beginning of life” (Special issue of La Revue musicale, 1922, p. 109). If this comment by Nadia Boulanger seems excessively romantic to modern listeners, it does indicate that the Messe basse, like the Requiem, is telling of Fauré’s penchant for a religious message that is based on peace and serenity. This Mass, published in 1907 by Heugel, is not a late work by Fauré, but an older work, composed during a holiday in 1881 at Villerville, in Normandy, with the collaboration of André Messager, that was taken up again at a later date and intended for a small women’s chorus, accompanied by a harmonium. This was a pleasant experience for Fauré and one that provided him with a welcome distraction from his activities at the Madeleine. Fauré composed the ‘Gloria’, the ‘Sanctus’, and the ‘Agnus Dei’; Messager did the ‘Kyrie’ and the ‘O salutaris’. The work was performed for the benefit of the fishermen of Villerville. It was done again the following year with light orchestration made by Messager (except for the ‘Agnus Dei’, which was arranged by Fauré). It was only much later, in 1906, that Fauré reworked his Mass and published it as the Messe basse. He replaced Messager’s ‘Kyrie’ with another of his own compositions, and used only the ‘Qui tollis’ from the ‘Gloria’, reworking it into the ‘Benedictus’. He also revised the ‘Sanctus’ and the ‘Agnus Dei’. The Messe basse requires few performers, the vocal work often depending on the alternation between a solo voice and a choral voice. Passages calling for three voices are also relatively rare: they occur either through the division of the choir into two parts, which sing against the soloist, or through the division of the chorus into three parts, as at the conclusion of the ‘Agnus’. The organ part, most often in four parts, except in some cases of octave doubling, or the addition of a fifth voice, more or less doubles the vocal lines. It is worth mentioning some of the discreet connections that link the Messe basse with other of Fauré’s works. The rhythm, with the quavers grouped in twos, and the backward and forward melody of the ‘Agnus Dei’, recalls the accompaniment to the ‘Offertorium’ from the Requiem. The cadential formula of bars 29–30 of the ‘Agnus’ from the Messe basse is, as well, a reminder of bars 6–7 from the Requiem’s ‘Agnus’. Finally, the melody from bars 31–33 of the ‘Kyrie’ is also found, albeit with a different rhythm, in the melody En prière of 1889. Thus one can see that the Messe re-presents fragments of works from the late 1880s, at a time when Fauré was no longer thinking of publishing it independently. These remarks tend to strengthen the hypothesis that the ‘Kyrie’ from the Messe basse was a reworking of an older piece rather than a new work dating from 1906. Le Requiem de Gabriel Fauré est une œuvre dont le succès n’a jamais faibli depuis ses premières exécutions publiques. On a souvent remarqué la rupture qu’il introduit dans l’histoire du genre: au Requiem très extériorisé, voire théâtral qui, non content de suggérer le repos éternellement serein que l’au-delà peut offrir, veut aussi peindre la colère tumultueuse du Jugement dernier, l’œuvre de Fauré s’attache essentiellement à procurer un recueillement paisible et consolateur. De l’aveu du compositeur, «elle est d’un caractère doux comme [lui]-même» (Gabriel Fauré, Correspondance (présentée et annotée par Jean-Michel Nectoux), Paris: Flammarion, 1980, p. 241: lettre de Fauré à Eugène Ysaÿe datée du 4 août 1900). L’histoire de l’œuvre peut être résumée en trois périodes. Dans une période initiale (1887-1888), le Requiem ne comporte que cinq mouvements («Introït et Kyrie», «Sanctus», «Pie Jesu», «Agnus dei» et «In paradisum»). Il se caractérise par un effectif réduit, sans instruments à vent: chœur mixte (avec voix soliste dans l’«In paradisum»), 2 altos, 2 violoncelles, contrebasse, orgue, harpe (seulement dans le «Sanctus», l’«Agnus Dei» et l’«In Paradisum»), violons (seulement dans le «Sanctus» et l’«In Paradisum»),timbales (seulement dans l’«Introït et Kyrie»). Dans une période intermédiaire (1888-1894), l’œuvre prend la forme en sept morceaux que nous lui connaissons. Fauré ajoute l’«Offertoire», qui prend d’abord la forme du seul solo de baryton («Hostias»), achevé en février 1889. Le chœur «O Domine», destiné à encadrer le solo de baryton, sera ajouté ultérieurement, à une date qu’il est impossible d’établir avec certitude. Le compositeur ajoute aussi le «Libera me», dont l’origine probable est une pièce composée dès 1877 (Jean-Michel Nectoux, Gabriel Fauré. Les voix du clair-obscur, Paris: Fayard, 2e éd. revue, 2008, p. 176), et dont une version complète existe dès 1889. Parallèlement à ces ajouts de nouveaux morceaux, Fauré modifie l’orchestration initiale par addition, selon les morceaux, de deux bassons, deux ou quatre cors, deux trompettes et trois trombones. La version résultant de ces ajouts progressifs sera jouée jusqu’à son remplacement par la «version définitive» en 1900. La période tardive (1900) est celle de la «version de concert», la plus connue du public. Suite à des demandes répétées de son éditeur Hamelle, Fauré accepte, en août 1898, de fournir une version destinée à une formation orchestrale plus habituelle (Fauré, Correspondance, op. cit., p. 232 (lettre à Julien Hamelle du 2 août 1898)), comprenant, en plus des instruments progressivement ajoutés à l’effectif initial, deux flûtes et deux clarinettes (Pie Jesu). De plus, il introduit les violons dans l’Agnus Dei et dans le Libera me. La première exécution de cette version définitive a lieu à Lille le 6 avril 1900, la deuxième à Paris, au Trocadéro, le 12 juillet de la même année, dans le cadre de l’Exposition universelle. D’autres exécutions eurent lieu en 1888, pour lesquelles les informations sont lacunaires. La deuxième exécution eut lieu deux semaines après la première, avec des «moyens d’exécution beaucoup plus restreints» (Fauré, Correspondance, op. cit., p. 140: lettre à Eugène d’Eichtal, datée probablement du 31 janvier 1888). Une nouvelle exécution eut encore lieu le 4 mai de la même année (Fauré, ibid., p. 141: lettres à Robert de Montesquiou du 3 mai 1888 et à Paul Poujaud de la même date). C’est très probablement cette audition que Camille Benoît («Balthazar Claes») évoque dans le Guide musical (nos 24–25 du 14 et 21 juin 1888, p.167): «Je laisse de côté, pour cette fois, sans la comprendre dans cette liquidation de fin de saison, l’audition qui eut lieu, à la Madeleine, il y a quelques semaines, d’une œuvre d’une beauté rare et achevée, la Messe de Requiem de M. Gabriel Fauré, me réservant d’en faire à loisir une étude spéciale». Le critique écrira en effet en août 1888 (nos 32–33 du 9 et 16 août) un compte rendu détaillé qui montre que l’œuvre ne comportait encore à cette date que les cinq mouvements d’origine, mais aussi que Fauré avait déjà ajouté une brève intervention des cors et des trompettes dans le Sanctus («Hosannah»). L’année suivante, l’œuvre fut exécutée le 13 février à la Madeleine, à l’occasion d’une messe annuelle organisée par la Croix-Rouge française «pour les soldats et les marins morts au service de la France». Cette cérémonie eut lieu dans une église «bondée», en présence de nombreuses personnalités politiques et militaires, dont le Maréchal de Mac-Mahon. L’importance de l’événement est attestée par la présence de comptes rendus dans tous les grands quotidiens. Si ces comptes rendus sont trop imprécis pour déterminer avec exactitude comment se présentait le Requiem à cette date, on sait toutefois que l’œuvre fut «chantée par la maîtrise sous la direction de M. Gabriel Fauré auquel avait été jointe une partie de l’orchestre et des choeurs de l’Opéra» (Le Figaro, 14 février 1889), mais aussi que la partie d’orgue fut jouée par Théodore Dubois (Le Matin, 8 février 1889), que le «Pie Jesu» fut chanté par «un jeune enfant, M. Paul Verdeau, soliste soprano» (Le Figaro, 14 février 1889), et que «les solis [furent] chantés par M. Auguez, de l’Opéra» (Le Siècle, 14 février 1899). Cette dernière précision est importante, car la présence du baryton Numa Auguez (1847–1903), dont il est écrit qu’il a chanté les soli, signifie que l’«Offertoire» et le «Libera me» faisaient déjà partie du Requiem à cette date. C’est l’œuvre telle qu’elle se présentait à cette époque qui est restituée pour la première fois dans le présent enregistrement (La version de 1889 a été publiée par Carus-Verlag (Stuttgart) en 2011 (CV 27.311)). Les principales différences qu’elle présente avec la version tardive seront indiquées plus bas. En plus du nouvel esprit que Fauré insuffle au genre du Requiem, une autre particularité de l’œuvre réside dans la façon dont le compositeur construit le texte liturgique. La suppression du «Dies irae» a été abondamment commentée dans la littérature musicologique: Fauré renonce à un aspect de la liturgie des morts auquel il n’adhère pas, le tumulte du Jugement dernier (Toutefois, l’absence de la séquence «Dies irae», une spécificité du rite parisien, n’est pas propre à Fauré. Cf. Tibor Kneif, article «Requiem», MGG2, Sachteil, vol. 8, col. 166). Domine, Jesu Christe, Rex gloriae, libera animas [omnium fidelium] defunctorum de poenis inferni, et de profundo lacu. Libera eas de ore leonis, ne absorbeat eas tartarus, ne cadant in obscurum; [sed signifer sanctus Michael repraesentet eas in lucem sanctam, *Quam olim Abrahae promisisti et semini ejus]. Seigneur, Jésus-Christ, Roi de gloire, délivre les âmes [de tous les fidèles] des défunts des peines de l’enfer et de l’abîme sans fond: délivre-les de la gueule du lion, afin que le gouffre horrible ne les engloutisse pas et qu’elles ne tombent pas dans les ténèbres. [Mais que Saint-Michel, le porte-étendard, les introduise dans la sainte lumière, *que tu as promise jadis à Abraham et à sa postérité]. V/. Hostias et preces tibi, Domine, laudis offerimus: tu suscipe pro animabus illis, quarum hodie memoriam facimus. Fac eas, Domine, de morte transire ad vitam. *Quam olim Abrahae promisisti et semini ejus. Nous t’offrons, Seigneur, le sacrifice et les prières de notre louange: reçois-les pour ces âmes dont nous faisons mémoire aujourd’hui. Seigneur, fais-les passer de la mort à la vie. *que tu as promise jadis à Abraham et à sa postérité. La première coupure a pour effet d’étendre la délivrance des âmes à tous les défunts, et non à celles des seuls fidèles. La seconde coupure supprime la mention de Saint-Michel, peut-être à cause de sa dimension guerrière de chef des armées célestes, et de son rôle de juge suprême. On doit aussi remarquer que l’insertion du dernier verset de la séquence («Pie Jesu») après le «Sanctus», soit comme musique d’élévation avant le «Benedictus», soit en remplacement de celui-ci, est un élément de la tradition française. Comme Gounod dans son Requiem posthume, Fauré choisit la solution du remplacement. Le «Libera me» est un répons qui prend place à l’Absoute, après la messe des morts. Si on le trouve aussi dans le Requiem de Verdi, sa présence est rare dans ce genre. Il donne l’occasion à Fauré d’une brève mise en œuvre de l’ethos du «Dies Irae» qui apparaît dans l’un des versets. Tout aussi rare est la mise en musique du «In paradisum». Il s’agit d’un chant qui accompagne le transport du corps de l’église vers le lieu d’inhumation. Ce choix conforte la couleur dominante que Fauré veut donner à son Requiem, qui s’achève dans la clarté: tonalité majeure répondant au ré mineur initial, registre aigu, et grand calme. L’«Offertoire» tel qu’il se présente dans cet enregistrement surprendra le mélomane habitué à la version complète, qui figure également dans l’enregistrement. Comme nous l’avons indiqué plus haut, cette pièce ne comporte pas encore le chœur «O Domine» en 1889 et se présente donc comme une pièce pour baryton solo et orchestre («Hostias»). Passé le premier mouvement de surprise, on remarque la cohérence de la version de 1889, où figurent deux pièces solistes de durées proches, l’«Offertoire» et le «Pie jesu», alternant avec des pièces chorales («Introït et Kyrie», «Sanctus»). De plus, la connexion thématique entre le «Te decet» de l’«Introït et Kyrie», le «fac eas Domine» de l’«Offertoire», et enfin le solo de violon du «Sanctus» renforcent le caractère étranger du «O Domine», dont nous avons déjà dit que le texte dérangeait Fauré. La première version a été écrite pour un effectif réduit. L’absence de violons rappelle Cherubini dans certains mouvements de ses deux Requiem. L’orgue est omniprésent, et sa relation avec les parties de cordes est le plus souvent une relation de doublure. Les cuivres peuvent intervenir pour des soli. Un beau passage avec solo, qui disparaîtra dans la version de 1900, est l’intervention des cors et trompettes à l’unisson dans l’«Introït et Kyrie» (mes. 28–29). De même, l’intervention qui précède le «fac eas Domine» dans l’«Offertoire», confiée à l’orgue dans la version de 1900, est doublée par le premier cor dans la version originale. À la fin du «Libera me», les timbales sont très présentes jusqu’à la fin dans la version originale alors qu’elles disparaissent après la mes. 124 dans la version de 1900. Dans l’accord final, les cuivres se joignent aux cordes pour renforcer le «soufflet» dynamique. On peut dire généralement que la version originale comporte une notation plus parcimonieuse de la dynamique. D’assez nombreuses indications ont été ajoutées plus tard. Un exemple intéressant se trouve dans le «Sanctus»: les indications dynamiques progressives de la version tardive, une fourche de crescendo à la mes. 37 et l’indication «poco a poco cresc.» à la mes. 39, sont absentes dans la version originale, où la nuance f des soprani au premier temps de la mes. 42 et le ff de l’orchestre au deuxième temps arrivent subitement. Le Cantique de Jean Racine fait partie des œuvres de jeunesse de Fauré. Il est couramment admis que le jeune Gabriel obtint en 1865 avec ce Cantique le premier prix de composition à l’Ecole Niedermeyer, après s’être présenté chaque année au concours depuis 1861, et avoir obtenu un deuxième prix en 1864. L’œuvre est dédiée à César Franck, qui la dirigea lors d’un concert de la Société nationale de musique le 15 mai 1875. Elle fut publiée dans sa version originale pour chœur et orgue en 1876. Une version avec un effectif instrumental fut réalisée dès 1866, et une orchestration en 1905. Le texte ne provient pas des quatre Cantiques spirituels de Racine, comme le titre le laisse penser, mais des Hymnes traduites du bréviaire romain. Il s’agit d’une paraphrase de l’hymne Consors paterni luminis, attribué à Saint Ambroise et chanté le mardi à matines. Il parut pour la première fois en 1688 dans la traduction du Bréviaire romain par Nicolas Le Tourneux (1640-1686). Le texte comporte trois strophes, traitées selon une construction musicale très claire. Les deux premières sont séparées par un interlude de l’orgue seul. Le début de la deuxième strophe, avec le choeur complet, contraste avec les entrées successives de la première strophe. La double série d’imitations sur «qui l’a conduit», dans une dynamique croissante (quatre entrées mf puis quatre entrées f) menant au sommet d’intensité de la pièce, marque la fin de la strophe. La troisième strophe donne lieu à un retour du matériau initial, des entrées successives, et de la tonalité principale de ré bémol majeur par un glissement de la dominante de la tonalité relative (si bémol mineur) vers l’accord de ré bémol majeur. Le dernier vers «Et de tes dons qu’il retourne comblé» est répété plusieurs fois, dans une détente progressive favorisée par l’alternance avec l’orgue seul. «La Messe Basse vaut mieux qu’une simple mention au hasard des notices biographiques—elle semble destinée à des moniales, car elle est trop paisible pour être mêlée aux agitations de notre vie moderne—et on voudrait l’entendre dans un de ces beaux cloîtres où règne le silence, où la vie est déjà de la mort, où la mort est le commencement de la vie» (Numéro spécial de La Revue musicale, 1922, p. 109). Si ce commentaire de Nadia Boulanger peut sembler excessivement romanesque pour un auditeur moderne, il est manifeste que la Messe basse, comme le Requiem, illustre le penchant de Fauré pour un message religieux centré sur la paix et la sérénité. Cette Messe, publiée en 1907 par Heugel, n’est pas une œuvre tardive de Fauré, mais la reprise d’une œuvre de jeunesse, composée en 1881 à Villerville, en Normandie, lors d’un séjour de vacances, avec la collaboration d’André Messager, et destinée à un petit choeur de femmes accompagné d’un harmonium. Ce fut pour Fauré une expérience agréable, qui lui procura une distraction appréciable par rapport à son activité à la Madeleine. Fauré composa le «Gloria», le «Sanctus» et l’«Agnus dei»; Messager le «Kyrie» et le «O salutaris». L’œuvre fut donnée au profit de l’association des pêcheurs de Villerville. Elle fut reprise l’année suivante dans une orchestration légère réalisée par Messager (sauf l’«Agnus Dei,» orchestré par Fauré). Ce n’est que tardivement, en 1906, que Fauré retravailla sa Messe et la publia comme Messe basse. Il remplaça le «Kyrie» de Messager par une pièce de sa composition, ne conserva du «Gloria» que le matériau du «Qui tollis» qu’il réutilisa pour composer le «Benedictus». Il révisa le «Sanctus» et l’«Agnus dei». La Messe basse est une œuvre à petit effectif, dont le dispositif vocal repose sur l’alternance entre une voix soliste et une voix chorale (sauf dans l’«Agnus dei» qui ne fait pas appel au soliste). On y trouve donc assez peu de véritable écriture à deux voix, car le soliste et le chœur ne se rencontrent le plus souvent que pour des jonctions à l’unisson ou à l’octave. Celle-ci se concentre principalement dans le «Sanctus». Les passages à trois voix sont eux aussi relativement rares: ils se produisent par division du chœur en deux parties contre la partie soliste, ou par division du chœur en trois voix à la fin de l’«Agnus». La partie d’orgue, le plus souvent à quatre voix, sauf dans quelques cas de doublures à l’octave ou d’ajout provisoire d’une cinquième voix, double presque systématiquement les voix chantées. Il est intéressant de mentionner quelques relations discrètes entre la Messe basse et d’autres œuvres de Fauré. Ainsi, le rythme avec les croches groupées par deux et la mélodie en «aller-retour» dans l’«Agnus» rappelle très clairement la figure d’accompagnement de l’«Offertoire» du Requiem. De même, la formule cadentielle des mes. 29–30 de l’«Agnus» de la Messe est très proche de celle des mes. 6–7 de l’Agnus du Requiem, ce qui devient encore plus frappant si l’on considère la transposition en la mineur de cette formule aux mes. 16–17. Enfin, la mélodie des mes. 31–33 du «Kyrie» est présente, avec un rythme différent, dans la mélodie «En prière» de 1889. On voit donc que la Messe reparaît sous forme de réminiscences dans des œuvres de la fin des années 1880, à une époque où Fauré ne songeait pas encore à la publier. Les remarques précédentes tendent à conforter l’hypothèse selon laquelle le «Kyrie» de la Messe basse serait plutôt la reprise d’une ancienne pièce qu’un mouvement nouvellement composé en 1906 (Cf. Nectoux, Fauré, op. cit., p. 172). Gabriel Faurés Requiem hat seit den ersten öffentlichen Aufführungen bis heute nichts an seiner Beliebtheit eingebüßt. Oft ist auf den Bruch hingewiesen worden, den es in der Geschichte des Genres darstellt: Traditionell ist das Requiem ein sehr ausdrucksstarkes, ja theatralisches Genre, das nicht nur die ewig friedvolle Ruhe des Jenseits suggeriert, sondern auch die stürmische Gewalt des Jüngsten Gerichts darstellt; das Werk Faurés dagegen hebt darauf ab, eine friedvolle und tröstende innere Sammlung herbeizuführen. Dem Bekenntnis des Komponisten nach hat das Requiem „einen sanftmütigen Charakter, wie [er] selbst“ (Gabriel Fauré, Correspondance, hg. von Jean-Michel Nectoux. Paris: Flammarion, 1980, S. 241: Brief von Fauré an Eugène Ysaÿe, datiert 4. August 1900). Die Geschichte des Werks kann in drei Perioden zusammengefasst werden. In der ersten Periode (1887-1888) bestand das Requiem aus nur fünf Sätz en („Introitus und Kyrie“, „Sanctus“, „Pie Jesus“, „Agnus Dei“ und „In paradisum“). Es war für einen verkleinerten Orchesterbestand geschrieben, ohne Blasinstrumente: ein gemischter Chor (mit Solisten in „In paradisum“), zwei Bratschen, zwei Cellos, Kontrabass, Orgel, Harfe (nur im „Sanctus“ und „In paradisum“) und Pauken (nur im „Introitus und Kyrie“). In einer Zwischenperiode (1888-1894) nahm das Werk die siebenteilige Form an, die wir heute kennen. Im Februar 1889 fügte Fauré das „Offertorium“ hinzu, das zunächst nur aus einem Baritonsolo bestand („Hostias“). Erst zu einem nicht sicher belegbaren späteren Zeitpunkt fasste der Komponist dieses Baritonsolo durch den Chor des „O Domine“ ein. Das „Libera me“, von dem eine vollständige Version ab 1889 nachweisbar ist, geht wahrscheinlich auf ein im Jahr 1877 komponiertes Stück zurück (Jean-Michel Nectoux, Gabriel Fauré. Les voix du clair-obscur. Paris: Fayard, zweite veränderte Auflage, 2008, S. 176). Parallel zu diesen Beifügungen weiterer Teile vergrößerte Fauré die anfängliche Orchestrierung in einzelnen Partien durch die Addition von zwei Fagotten, zwei bis vier Hörnern, zwei Trompeten und drei Posaunen. Die aus diesen Veränderungen resultierende Version des Requiems wurde bis zu ihrer Ablösung durch die Endfassung des Jahres 1900 gespielt. Die letzte Periode der Werkentstehung führte zu der Konzertversion (1900), die dem heutigen Publikum am besten bekannt ist. Im August 1898 gab Fauré dem wiederholten Drängen seines Herausgebers Hamelle nach, eine Fassung für eine gängigere orchestralen Besetzung in Auftrag zu nehmen. (Fauré, Correspondance, op. cit., S. 232: Brief an Julien Hamelle vom 2. August 1898) Diese Fassung enthielt zusätzlich zu den in den vorangegangenen Jahren nach und nach hinzugefügten Instrumenten noch zwei Querflöten und zwei Klarinetten („Pie Jesu“). Außerdem führte Fauré nun die Violinen in das „Agnus Dei“ und das „Libera me“ ein. Die erste Aufführung dieser Endfassung fand am 6. April 1900 in Lille statt, die zweite am 12. Juli desselben Jahres im Rahmen der Weltausstellung im Pariser Palais du Trocadéro. Im selben Jahr fanden noch weitere Aufführungen statt , für die jedoch nur wenige Belege existieren. Bereits Ende Januar wurde das Requiem erneut aufgeführt, diesmal mit „stark eingeschränkter Orchestrierung“. (Fauré, Correspondance, op. cit., S. 140: Brief an Eugène d’Eichtal, wahrscheinlich vom 31. Januar 1888). Eine weitere Aufführung fand am 4. Mai 1888 statt , auf die sich Camille Benoît in einem ausführlichen Artikel vom August 1888 (Nr. 32–33 vom 9. und 16. August) bezieht. Aus Benoîts Text geht hervor, dass das Werk damals nur aus den fünf ursprünglichen Sätz en bestand, aber auch, dass Fauré schon einen kurzen Einsatz der Hörner und Trompeten in das „Sanctus“ („Hosannah“) eingefügt hatte. Im folgenden Jahr wurde das Werk am 13. Februar noch einmal in der Madeleine aufgeführt: diesmal im Rahmen einer jährlich vom französischen Roten Kreuz im Andenken an die für Frankreich gefallenen Soldaten organisierten Messe. Diese Zeremonie fand in einer vollbesetz ten Kirche statt (Fauré, ibid., S. 141: Briefe an Robert de Montesquiou und an Paul Poujaud, beide vom 3. Mai 1888), in Anwesenheit zahlreicher politischer und militärischer Persönlichkeiten, darunter auch des Maréchal de Mac-Mahon. Die Wichtigkeit dieser Veranstaltung ist durch Berichte in allen großen Tageszeitungen belegt. Wenn diese Berichte auch zu ungenau sind um daraus genau zu ersehen, welche Form das Requiem zu diesem Zeitpunkt hatte, so wissen wir doch, dass das Werk „unter Leitung von Herrn Gabriel Fauré vom Chor der Madeleine gesungen wurde und von einem Teil des Orchesters und der Chöre der Oper unterstützt wurden“ (Le Figaro, 14. Februar 1889). Wir wissen auch, dass Théodore Dubois die Orgel spielte (Le Matin, 8. Februar 1889), dass das Sopransolo des „Pie Jesu“ von einem Knaben namens Paul Verdeau gesungen wurde (Le Figaro, 14. Februar 1889) und dass „Herr Auguez von der Oper“ weitere Soli übernahm (Le Siècle, 14. Februar 1899). Diese letztere Angabe ist wichtig, denn die Anwesenheit des Baritons Numa Auguez (1847–1903) und der Hinweis darauf, dass er mehrere Soli sang, bedeutet, dass das „Offertorium“ und das „Libera me“ damals schon Teile des Requiems waren. Die vorliegende Aufnahme rekonstruiert die damalige Fassung des Werks (Die Fassung von 1889 wurde 2011 vom Carus-Verlag (Stutt gart) herausgegeben (CV 27.311)). Auf die Hauptunterschiede zwischen dieser und der späteren Version wird weiter unten einzugehen sein. Domine Jesu Christe, Rex gloriae, libera animas [omnium fidelium] defunctorum de poenis inferni, et de profundo lacu. Libera eas de ore leonis, ne absorbeat eas tartarus, ne cadant in obscurum; [sed signifer sanctus Michael repraesentet eas in lucem sanctam, *Quam olim Abrahae promisisti et semini ejus]. Herr Jesus Christus, König der Herrlichkeit, bewahre die Seelen [aller] [der] v[V]erstorbenen [Gläubigen] vor den Qualen der Hölle und vor den Tiefen der Unterwelt. Bewahre sie vor dem Rachen des Löwen, dass die Hölle sie nicht verschlinge, dass sie nicht hinabstürzen in die Finsternis. [Vielmehr geleite sie Sankt Michael, der Bannerträger, in das heilige Licht, *das du einstens dem Abraham verheißen und seinen Nachkommen]. Opfergaben und Gebet bringen wir zum Lobe dir dar, o Herr; nimm sie an für jene Seelen, derer wir heute gedenken. Herr, lass sie vom Tode hinübergehen zum Leben, *das du einstens dem Abraham verheißen und seinen Nachkommen. Die erste Streichung bewirkt, dass die Bitte um die Bewahrung der Seelen auf alle Verstorbenen ausgedehnt wird und nicht nur auf die Gläubigen bezogen bleibt. Die zweite Auslassung, die den Erzengel Michael betrifft, mag wegen dessen kriegerischer Eigenschaft als Fürst der himmlischen Heerscharen vorgenommen worden sein. Anzumerken ist auch, dass die Einfügung des letzten Verses der liturgischen Sequenz („Pie Jesu“) nach dem „Sanctus“—entweder vor dem „Benedictus“ oder an dessen Stelle—der französischen Tradition entspricht. Wie Gounod in seinem posthumen Requiem, so wählt auch Fauré den Weg der Ersetzung des „Benedictus“. Das „Libera me“ ist ein Reponsorium, das seinen Platz traditionell in Verbindung mit der Absolution, also im Anschluss an die Totenmesse hat. Zwar findet es sich auch im Requiem Verdis, es ist aber ungewöhnlich in diesem Genre. Die Aufnahme des „Libera me“ in sein Requiem gibt Fauré die Gelegenheit, das Ethos des „Dies irae“ kurz anklingen zu lassen. Ebenso ungewöhnlich ist Faurés Vertonung des „In paradisum“. Hier handelt es sich um eine Totenklage, die die Überführung des Leichnams von der Kirche zur Grabstätte begleitet. Faurés Vertonung unterstützt auch hier die dominierende Klangfarbe seines Requiems: Eine Dur-Tonalität, die dem D-Moll des Anfangs antwortet, schafft eine Atmosphäre der Klarheit und großer Ruhe. Das „Offertorium“, wie wir es in der vorliegenden Aufnahme hören, mag den Musikfreund überraschen, der an die vollständige Version gewöhnt ist. Wie weiter oben ausgeführt wurde, schließt die Fassung des „Offertorium“ aus dem Jahr 1889 die Chorpartie des „O Domine“ noch nicht mit ein; sondern besteht lediglich aus dem durch Bariton und Orchester getragenen „Hostias“. Hat man die anfängliche Überraschung überwunden, offenbart sich die Kohärenz und Stimmigkeit dieser Fassung von 1889: Zwei Soli-Passagen ähnlicher Dauer („Offertorium“, „Pie Jesu“) alternieren mit zwei Chorpartien („Introitus und Kyrie“, „Sanctus“). Darüber hinaus betont die thematische Verbindung zwischen dem „Te decet“ des „Introitus und Kyrie“, dem „fac eas Domine“ des „Offertorium“ und dem Violinsolo des „Sanctus“ die Ausnahmestellung des „O Domine“, dessen Text Fauré—wie bereits erwähnt – befremdete. Die Urfassung des Requiem wurde mit Blick auf eine reduzierte Orchesterbesetz ung geschrieben. Das klangliche Gleichgewicht ist in der mittleren Tonlage angesiedelt. Die Abwesenheit von Violinen erinnert an einzelne Sätze in Cherubinis zwei Requiems. Orgelmusik durchzieht die ganze Messe und unterlegt oft die Streicherstimmen. In dieser Urfassung werden Bläser für die Untermalung von Soli eingesetzt: Eine schöne Passage von Hörnern und Trompeten mit Solo, die in der Fassung von 1900 nicht mehr enthalten ist, findet sich im „Introitus und Kyrie“ (Takt 28–29). Ein weiterer Horneinsatz unterstreicht die Passage, die dem „fac eas Domine“ im „Offertorium“ vorangeht und die in der Version von 1900 allein von der Orgel getragen wird. Am Ende des „Libera me“ sind in der Originalfassung die Pauken bis zum Ende der Partie sehr präsent; in der Fassung von 1900 dagegen verschwinden sie nach dem Takt 124. Im Schlussakkord verbinden die Bläser sich mit den Streichern, um den dynamischen Effekt zu unterstreichen. Allgemein ist zudem anzumerken, dass die Urfassung noch eine sparsamere Notation der Dynamik enthält; eine beträchtliche Anzahl von Angaben wurde erst später eingefügt. Ein interessantes Beispiel findet sich im „Sanctus“: Die dynamischen Bezeichnungen der späteren Fassung sowie auch ein Crescendo-Bogen am Takt 37 und die Angabe „poco a poco cresc.“ am Takt 39 fehlen in der Urfassung. Hier treten die Angaben f für die Sopranstimmen und ff für das Orchester (Takt 42) plötzlich und ohne Einleitung auf. Das Cantique de Jean Racine gehört zu den Jugendwerken Faurés. Es gilt heute in der Forschung als gesichert, dass 1865 dem jungen Komponisten für dieses Werk der erste Preis im Kompositionswettbewerb der Ecole Niedermeyer zuerkannt wurde (schon in den vier vorangegangenen Jahren hatte Fauré Arbeiten in diesen Wettbewerb eingereicht und 1864 einen zweiten Preis erzielt). Das Werk ist César Franck gewidmet, der es am 15. Mai 1875 im Rahmen eines Konzerts der Société Nationale de Musique dirigierte. 1876 wurde es in der Originalfassung für Chor und Orgel veröffentlicht. Eine Version mit instrumentaler Besetzung wurde seit 1866 aufgeführt und seit 1905 existiert eine vollständig orchestrierte Fassung. Der Text stammt nicht aus den vier Cantiques spirituels von Racine, wie der Titel vermuten ließe, sondern aus den Hymnes traduites du bréviaire romain (Hymnen des römischen Breviarium). Es handelt sich um eine adaptierte Fassung der Hymne Consors paterni luminis, die dem heiligen Ambrosius zugeschrieben und im Frühgottesdienst an Dienstagen gesungen wird. Die hier vorliegende Textadaptation geht auf eine erstmals 1688 veröffentlichte Übersetzung des Bréviaire romain von Nicolas Le Tourneux (1640-1686) zurück. Der Text besteht aus drei Strophen, die in einer sehr klaren musikalischen Struktur vertont sind. Die beiden ersten Strophen sind durch ein Orgelzwischenspiel getrennt. Der Anfang der zweiten Strophe, die mit dem vollen Chor einsetzt, kontrastiert mit den sukzessiven Einsätz en der ersten Strophe. Die doppelte Folge von Variationen auf „qui l’a conduit“, in anschwellender Dynamik (vier Einsätze mf, gefolgt von vier Einsätz en f) führt zum Höhepunkt der Intensität des Stücks am Strophenende. In der dritten Strophe erfolgt eine Wiederaufnahme des Eingangsmaterials, der sukzessiven Einsätze und der dominierenden D-Dur Tonart, die hier durch ein Übergleiten der H-Dur Dominante in den D-Dur Akkord hergestellt wird. Der Endvers „Et de tes dons qu’il retourne comblé“ wird mehrmals wiederholt und die dadurch entstehende allmähliche Beruhigung durch das alternierende Orgelspiel unterstützt. „Die Messe basse ist mehr wert als eine kleine Zufallserwähnung in den biographischen Beschreibungen—sie scheint für Nonnenchöre bestimmt zu sein, denn sie ist weit entfernt von den Aufregungen unseres modernen Lebens. Man möchte sie in einem dieser schönen Klöster hören, in denen die Ruhe waltet, wo das Leben schon Teil des Todes ist, wo der Tod der Anfang des Lebens ist“ (Sonderausgabe der Revue musicale, 1922, S. 109). Wenn dieser Kommentar von Nadia Boulanger dem modernen Zuhörer auch übermäßig blumig erscheinen mag, so ist doch offenbar, dass die Messe basse, ebenso wie das Requiem, Faurés Neigung zu einer auf friedvolle Ruhe ausgerichtete religiöse Botschaft beweist. Diese 1907 von Heugel veröffentlichte Messe ist kein spätes Werk Faurés, sondern die Reprise eines Jugendwerks, das er 1881 während eines Ferienaufenthalts im normannischen Dorf Villerville in Zusammenarbeit mit André Messager komponiert hatte und das für einen kleinen von einem Harmonium begleiteten weiblichen Chor bestimmt war. Zu diesem Zeitpunkt bedeutete die Komposition dieses Werks für Fauré eine angenehme Ablenkung von seinen Aufführungen in der Madeleine. Die Sätze „Gloria“, „Sanctus“ und „Agnus Dei“ stammen von ihm, „Kyrie“ und „O salutaris“ sind von Messager. Das Werk wurde 1881 zu Gunsten des Fischervereins Villervilles aufgeführt und im folgenden Jahr in verkleinerter Orchestrierung von Messager wieder aufgenommen (nur das „Agnus Dei“ wurde von Fauré orchestriert). Erst später—im Jahre 1906—bearbeitete Fauré diese Messe neu und veröffentlichte sie unter dem Namen Messe basse. Er ersetzte das „Kyrie“ von Messager mit einem von ihm selbst komponierten Satz und behielt vom „Gloria“ nur das Material des „Qui tollis“ bei, das er für die Komposition des „Benedictus“ benutzte. Er unterzog auch das „Sanctus“ und das „Agnus Dei“ einer Neubearbeitung. Die Messe basse ist für eine kleine Besetzung geschrieben, deren stimmliche Struktur auf dem Wechsel zwischen einer Solisten- und einer Chorstimme aufbaut (außer im „Agnus Dei“, indem es keinen Solisten gibt). Wo Solist und Chor gleichzeitig singen, vereinigen sie sich meist im Unisono oder im Oktavintervall. So gibt es in dieser Messe nur sehr wenige musikalische Partien für zwei verschiedene ineinandergreifende Stimmen; diese finden sich hauptsächlich im „Sanctus“. Ebenso selten erscheinen dreistimmige Passagen: Sie entstehen durch Zweiteilung des Chors (mit Solostimme) oder—am Ende des „Agnus Dei“—durch Dreiteilung der Chorstimmen. Die Orgelpartie folgt fast durchgehend den Singstimmen und besteht zumeist aus vier Stimmenùaußer in jenen wenigen Fällen, in denen die Orgel die Singstimme im Oktavintervall begleitet oder als fünfte Stimme hinzugefügt wird. 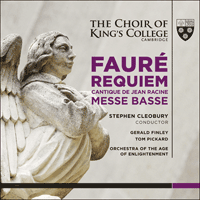 Made in January 2014, this is the first recording of Marc Rigaudière’s reconstruction of the first complete liturgical performance of Fauré’s Requiem. This version employs a small orchestra of violas, cellos and basses, augmented by solo violin in one movement, and brass and timpani in others. The instruments and techniques used by the Orchestra of the Age of Enlightenment in this recording seek to re-create the sound world of a late nineteenth-century orchestra in Paris. No stops, just couplers from the two manuals.